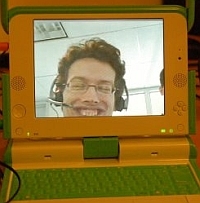 Now that was a decent hack in itself - video conferencing on a 400Mhz AMD Geode processor - but it wasn't until a week later that Robert went from OLPC to standard laptop video conferencing, to full fledged OLPC XO-1 to OLPC XO-1 simultaneous audio and video transfer. And it wasn't until this week that Chris Ball achieved the first trans-Atlantic (and trans-Cambridge) videoconference on the OLPC. It's only too bad the experience left him looking like an uber-dork. Now the next step is multi-user video conferencing, classroom conferencing if you will, on a global scale. Imagine entire country's classrooms, full of children, in a massive multiplayer online conference. An E3 or Computex of students who view source code or explore the OLPC Library of Alexandria. I just hope that SES Global can handle all that data traffic on its donated bandwidth or there will be a lot of disappointed children (and adults). While I haven't been around as much to post due to my workload, it's still bothered me that every article that covers some significant technical achievement by this project has backhanded compliments and links to other, less positive articles on this site. I finally figured out why that is. You said that in your capacity as director of Geekcorps. One of Geekcorps' technology partners is the "Intel Emerging Markets Group". You may remember one of Intel's products for emerging markets.... the Classmate PC, which runs Windows. You might say that's "the same software... enjoyed by Americans," though I would dispute the word "enjoyed". Two months later, you registered this domain. You're really not running an independent site at all; you came into this with the opinion that no one would want what the OLPC is producing. You have referred to me as a "cheerleader" when I'm actually pretty skeptical about the project's viability (albeit very interested in it), meaning someone who's an actual OLPC supporter might be painted as a nut. And with that, I think I'm done with olpcnews.com. Google Alerts will have to keep me up to date on OLPC, since there are no RSS-able news sites with a neutral to hopeful stance on the project. How can making fun of someone's appearance in bulky headphones possibly be construed as "news"? raindog, I think you are being too extreme. I really don't think Wayan is an astro-turfer in the pay of Intel and Microsoft. Yes, Wayan makes some ill-founded criticisms of olpc, but he also publicizes lots of good things, like this post on video conferencing, and clearly is excited about a lot of aspects of olpc. I think some of his objections point to real problems, like where to come up with all the money needed (even if you take a low estimate of the costs), and how teachers will respond to a wildly-different educational model. For someone like me who wants to keep up with oplc without reading a lot of lists and wiki's, oplcnews.com is a great resource, so I am going to keep reading it. this will be an awesome feature w/in communities. W/ mesh wi-fi people could videoconference b/w villages. It will be hard to do across the internet because of bandwidth constraints. Mesh wi-fi isn't that expensive, you do it w/ modded off-the shelf Linksys wi-fi routers. And that's the second time you've quit OLPC News. Sad to see you go (again), but to accuse me of being a shill for anyone - Intel or otherwise would be offensive if it were not so fanciful. But thanks for the compliment - that this small hobby of ours, blogging about the OLPC, is so influential and professional that you believe it beyond the abilities of a loose association of writers and commenters. If you ever come back, my previous offer stands - you too can write for OLPC News. Thank you for interest in One to One Video Conferencing Per Child. And thank you for reading this post to the end of the comments. Unfortunately, due to inordinate amounts of comment spam directed at this post, we've had to close comments.